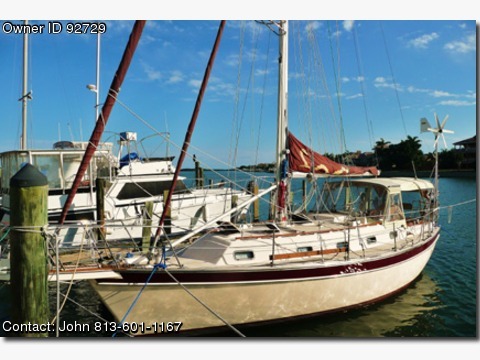 Contact Boat Owner John @ 813-601-1167 or jklesniak@verizon.net Price just reduced! 1995 Island Packet IP-37,This Island Packet-37 offers performance with its innovative "Full Foil Keel" design that has outperformed other boats in its size range. Its superior safety qualities, ease of handling and spacious accommodations have provided the ideal cruising boat. This particular boat was outfitted with all the amenities for extended cruising.The interior of this IP-37 has a satin polyurethane finish throughout with an abundance of storage. The main salon has a fold away table which is mounted on the bulkhead. When lowered a built-in bottle and glass storage rack is revealed. The table will expand again to provide dinning on both sides of the salon. A pullout panel in the L-shaped port settee converts this area into a double berth. The forward and aft staterooms with spacious double berths up to 6'-6" in length also have generous lockers. The navigation station, stowage tray and a chart drawer, compliments the main salon. The AC/DC electrical controls and other breakers are also located at the nav. station. The head has a stand-up shower and is accessible from both the main salon and vee-berth. The wrap-around galley to starboard features a gimbaled 3-burner propane stove with oven, deep double SS sink, refrigeration compartment with freezer and GE micro-wave. There is also a flip-up counter extension for additional food prep space or serving.This is a cutter rig saiboat with a self-tacking staysail with a boom. A continuous line reefing system and Schaefer furling allows easy handling when the wind freshens. A cruising spiniker with all assessories round out the sail inventory. Double life lines and convenient hand rails make negotiating the length of the vessel safe in all points of sailing. The hardtop bimini and cockpit enclosure provides additional escurity in all types of weather.The equipment on this boat is too numerous to present in this ad. It is ready for cruising: from a water-maker & single side-band to chart plotter, radar, wind generator, full electronics, spare parts and ground tackle. a 10' Avon inflatable with a 8HP Mercruy outboard is also part of the equip itinerary. If there is interest in the equipment details of this vessel, including model descriptions, please contact John Lesniak for this information. I can send a hard copy or e-mail the list.